This dip can be the key to success of your reunions and family meals. When you prepare it you will see that your guests don’t stop eating it, until is finished and surely they will ask for more... incidentally they will also ask you for the recipe. The preparation is very simple because it basically consists of combining the creaminess and neutrality of the cream cheese with the hotness and smoky flavor of the chipotle pepper. The mixture is very interesting and irresistible because the cream cheese and the chipotle pepper complement perfectly well. 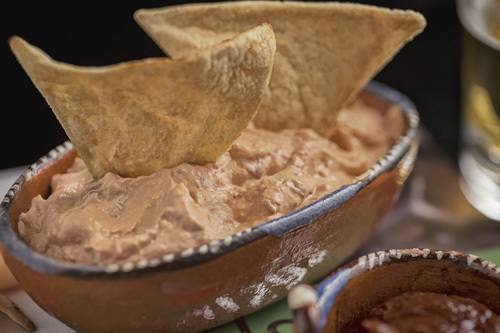 Normally this dip is served with tortilla chips but it can also be enjoyed with crackers, with mixed vegetables, with chips, etc. Although you can go further and use the dip to fill some steamed zucchini or some baked potatoes. Enjoy it! The preparation of this recipe is super easy. To make the recipe chipotle peppers in adobo are needed, that can be bought canned. Use a natural cream cheese so the dip’s flavor is not altered. In less than 5 minutes your dip will be ready. 6 Chipotle Peppers in Adobo. Variation: Would you like to change the cream cheese for yogurt ? Did you like the Dip? These chipotle peppers in adobo have an excellent seasoning use them. Use organic pepper so the dip has more flavor. This is the perfect bowl to put the dip.